We're huge fans of Ryan Adams' work. "God save us all from Ryan Adams." EDITOR'S NOTE: We published this review of Ryan Adams' latest full-length record for the first time back in July 2007, a couple of weeks after "Easy Tiger" was released. The piece appears today to commemorate the musician's Boston gig this past Sunday. You can check out the live review of the country-laced show from the Globe's Joan Anderman (one of our favorite music writers on the national scene) here. EASY TIGER: Ryan Adams' ninth studio album was released less than two weeks ago and it's one of my favorites in his collection. I realize now why that is... His label took some of his creative freedoms away. The album is an impeccable mish-mash off all Ryan's music genres: he dances from rock; "Halloweenhead," to country twang; "Pearls on a String," to vocal-strengthened guitar tracks; "Two" (which features Sheryl Crow), on to blues-influenced Grateful Dead-homage music, "Goodnight Rose." 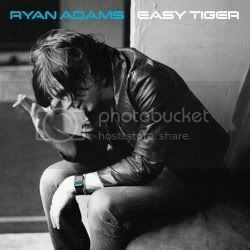 Returning back to the Ryan Adams who is recorded on Easy Tiger... The artist may feel cornered, but he triumphs with Easy Tiger. Adams is still making great songs without regard to what people might consider his proper music type. The song order are a bit of a jumble - but the fact that there 13 tracks versus the three full-length albums Ryan released over a nine-and-a-half months. That's a hell of a lot of music to put your arms around. Fans would inevitably arrive at a show interested in hearing specific songs they enjoy, but Ryan would have already moved on... Good for Ryan, keeping it fresh while on the road. But not always great for fans who had not yet fallen in love with three albums worth of brand new material. And still, Ryan has survived to release new material... So the bottom line is that while a bit disjointed at times, Easy Tiger is digestible and each track unbelievably tight. The songwriting and performances are concise. I thoroughly enjoy this record - despite how much Adams wanted to make a different one. I have elected to share one of my favorite tracks from the new record, "Everybody Knows." It's one of the songs that dances on the fine line between the music types that live on Easy Tiger. It could be the best song on the record. I will let you decide. Go out and buy the record.